SAY HELLO TO TORI! 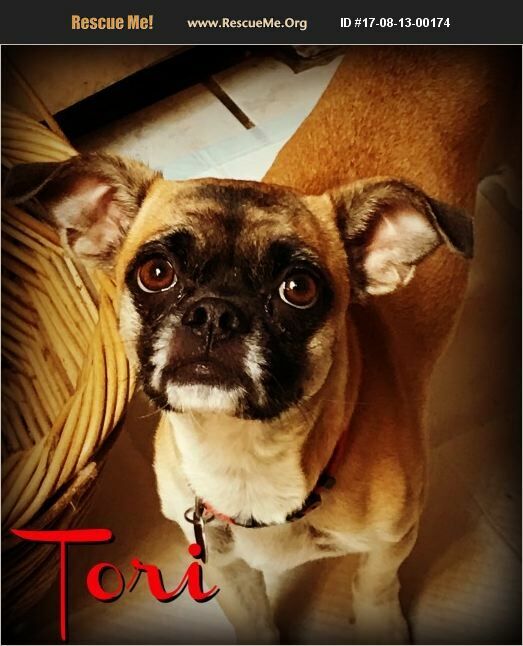 Tori is an adorable 18 month old Pug / Chihuahua mix girl. This little 'Chug' doll weighs in at just 14 pounds. Surrendered to our rescue, Tori is a very sweet girl who is eager to please, always happy to see you and VERY loyal. She is fearful of strange people and new situations, but we are working on that daily. She might bark upon meeting new people as she is very timid, but once she sees they mean no harm and are welcome guests, she welcomes them as well. If you want a companion who is completely devoted to you, Tori is your girl! She is as cute as she is sweet and would love a home with possibly one other dog that is both close to her size and age as well as her personality. Tori gets on well with her foster mates and would do very well in a quieter home with adults or adults with older teens ~ no toddlers or kids under the age of 12. Tori's coat is a beautiful golden color with black mask. It's a shorter coat, so it will be easy to maintain. She will require baths as needed and regular nail trims. Tori walks like a lady on her leash and rides well in the car. She is housetrained, however will require gentle guidance and patience as she adjusts to her new family's home and routine. This beautiful angel will be such a wonderful family addition for years to come! Tori's adoption fee is $ 300.00. This fee includes her Veterinarian visits, spay, all vaccinations including rabies and bordatella, de-worming, microchip and professional groom.